Besieged by the Horde, a desperate band of heroes prepare to defend their outpost at all costs. 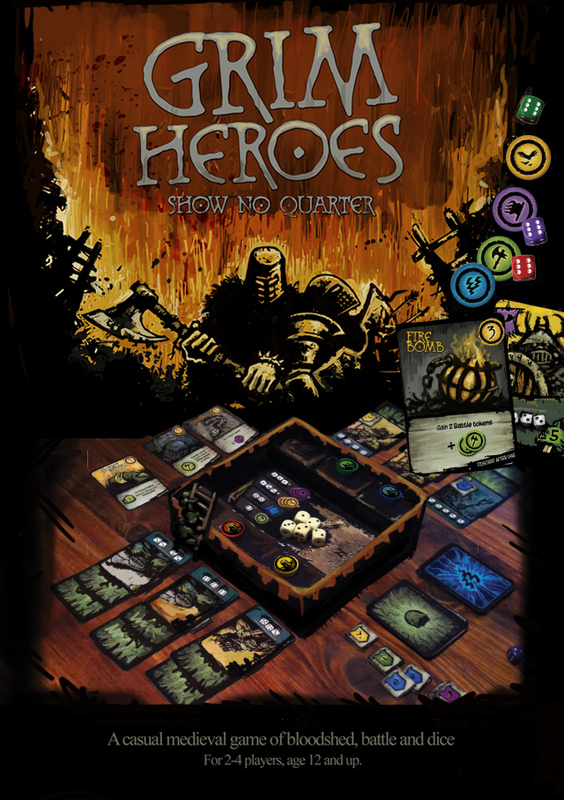 Grim Heroes is the second game to feature the DiceQuest game system designed by Simon McGregor, the dice-engine behind Ancient Terrible Things (ATT). – Semi co-operative play through the introduction of the Traitor player. – 3D Fortress game-box, with a unique raised dice-tray , allowing for an immersive board game experience, and contained dice rolling. – Siege ladders, boiling oil and plenty of vile monsters! Grim Heroes has made way for a new DiceQuest game with a very different theme. Expect an announcement here in the next week. We will have a new KS starting 30 March 2017. I never saw an announcement. What is this new game that bumped Grim Heroes? This looks great, when can we expect to see it? Will it be a Kickstarter? KS is scheduled for March 2017. Still looking at next March for launch? The graphic says Q3/2016. Always the best content from these pridugoois writers. This looks GREAT! Can’t wait to hear/see more! The current mechanic is balanced for 4 players, but there is always the potential for another. I don’t how I’ll be able to wait for these games. It’s Simon’s art that does it. Simon has no peers. These are far and away the best, best, BEST looking games available today. Pleeeeeeease get Snowblind and Grim Heroes on Kickstarter right away so we can send you all of our money now! Please! Rob/Simon, please start designing and working on a fantasy/creepy themed collectible or LCG card game. What an unbelievable privilege it would be for us to be able to buy and collect hundreds of little Simon McGregor masterpieces! Thank you for the compliments, Mark. The artwork is created by Rob. Simon is the man behind the game mechanics! This looks awesome! I love ATT, backed it this week on KS. This one absolutely looks fun! Looks very cool! Let me know when the Kickstarter is going live, if that’s the way you go! Any info on how close we are to a KS? Grim Heroes is provisionally scheduled for launch in 2016. As we picked up ATT in Essen 2014, glad to see that game system is developed further. We adored ATT at this moment! Looks great! Please let me know, when this gets to KS! Thank you! I am absolutely, 100% in love with the artwork in these games! It is the best I’ve seen in many years. I bought ATT based on BGG reviews. I’ve watched the ATT Youtube videos and am very anxious to start playing. I will be buying every game you release. If ATT is anything to go by (which my family loves), this should turn out to be a pretty amazing game. I’m in if/when it kickstarts! Grim Heroes looks to be an exciting ‘States of Siege’ or Ghost Stories type of game, but with the dice mechanics of Ancient Terrible Things. The box as the outpost with a raised dice tray is a nifty aspect. I’m looking forward to more updates and designer notes about this game. Looks like the same great artwork is in full display (I particularly like the yellow token image of soaring buzzards awaiting a feast. I hope that icon stays in published copy. If possible, also post the b&w art of Rob van Zyl!